I must admit that I bought this mostly because Renée Fleming is in it. I didn't expect much from the opera itself. But guess what? I loved it so much that I played the complete opera two times on the same day! Opinions about this work are very divided actually, varying from "a waste of time" to "one of the best operas from the last fifty years or so." I'm in no position to count it among the best of the last half century - I haven't heard enough operas from living composers to make that judgement. Having said that, I can easily imagine this becoming an opera that will be performed and/or recorded on a semi-regular basis - if they are willing to do so it will definitely find an audience. I don't know if it would make much of an impact with a less than great cast though. The libretto (by Philip Lettell) is very good IMO. It doesn't try to change too much of the story and structure we're familiar with from the play/movie. Previn's music is modern but pretty accessible and snippets of New Orleans type jazz are included - appropriate for the time and place of the story. The cast is without exception very good. Fleming is great as Blanche, for me a more sympathetic figure than Vivien Leigh in the movie (but I admit that I have a soft spot for Renée). Rodney Gilfrey is a very convincing, scary Kowalski. I think he based his portrayal more on Brando's than Fleming did hers on Leigh's actually. Elizabeth Futral's Stella is a real sweetie and her singing was somewhat of a revelation to me. Last edited by jhar26; Dec-24-2010 at 09:46. I've quickly checked a few of them out and they are of great quality. These dvd's are either originals or else absolutely perfect copies - and I can't rule that out at these prices. ...Probably copies. I played La Fanciulla del West today and it skips at the end. I wrote to the guy and he answered that he'll send a replacement. I hope that he uses top quality DVDR's or else in a year or so there will be nothing to see but green spots and skipping. I could be wrong of course, but I'm beginning to have my doubts. I fear that this guy is too good to be true. No complaints from the other dvd's I played so far - they play perfectly. Maybe he's on the level after all. ...Probably copies. I played La Fanciulla del West today and it skips at the end. I wrote to the guy and he answered that he'll send a replacement. The replacement he send me skips even worse than the first one. One of the other dvd's I ordered from him skips also, and I've only seen five so far. Just writing this as a warning to other members who might consider buying dvd's from this guy because of his cheap prices. Don't, because they aren't value for money. Most of them probably play ok, but if he uses very cheap dvdr's (and he probably does) they won't last for very long. Don't be a dope like I was and stay away from this guy. Thanks for the warning. Of course it's not so bad as it seems, probably, because even if some of them are faulty, you probably still have enough good ones to make your experiment worthwhile. So obvious that you're sure to have tried it - but just in case .... have you tried playing the dodgy ones on a different player - or on your computer? They could be player-sensitive. Well, he has promised to send me yet another copy of that Fanciulla del West DVD plus the Eugen Onegin which skips also and he says that he will send replacements for any other faulty ones there may be. I only hope that if these are copies (and they probably are VERY good copies in my opinion) that he uses top quality DVDR's because poor ones have a very short lifespan. I have tried them on two dvd players and on my computer - all with the same result. Netrebko does vocally very well in my opinion and she's great to watch too. Not only because she's such a gorgeous looking lady but also because she's a good actress, and one who uses the entire stage to her advantage. In fact, the rest of the cast looks like a bunch of statues compared to her. Vocally they are all acceptable though, but Netrebko is clearly the star of the show in every meaning of the word. We went to see it, and it's a wonderful film! Last edited by msegers; Feb-28-2009 at 02:04. Reason: Added information. Oh marvellous! Thanks very much indeed - this is just what I needed. I think I need to get one, don't I? Meanwhile, back to Handel opera on DVD. I know that nothing is ever going to surpass that stupendous Glyndebourne Giulio Cesare, Gaston - but is there anything that comes even close? I can of course only speak for myself, but knowing your love for Puccini I think you would enjoy it as well. I for one love it. There's almost an hours worth of bonus material included also - interviews with the director, Anna and Villazon plus a behind the scenes 'the making of.' There's also a nice booklet. You mean in baroque opera? 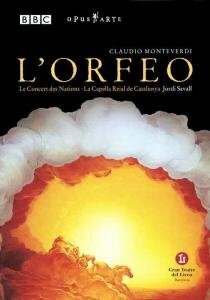 I don't know if you like Monteverdi, but if you do I can recommend this "L'Orfeo." There's also a nice booklet. You mean in baroque opera? No (but your tip is noted, thanks); I meant Handel opera, specifically. It's nothing extravagant though. Just 16 pages, but informative and some beautiful pictures of Villazon and you know who. I sometimes check some reviews of Handel dvd's and watch some youtubes but they are nearly always set in the 20th century with characters dressed like accountants and dentists. Not that it necessarily has to be all bad, but knowing my own tastes I think that the risk of being disappointed would be substantial. The director of that La Boheme movie has some interesting things to say about modern opera productions. That is, I find them interesting because I happen to agree with him. When asked what his interpretation of La Boheme was he said, "Puccini's." He didn't see the need to set it in the 21st century and to let Mimi die of aids.